Happy New Year from LogoTalk.Net! To start off the new year right, I am pleased to announce the opening of private consultations based on logotherapy and existential analysis. Consultations as offered here are not a medical or psychological service and are not a substitute for psychotherapy. Whereas psychotherapy helps a client with psychological symptoms return to an optimal level of functioning, Defiant Power Solutions collaborates with a person to achieve excellence in living. Personal Consultations by Telephone: Personal consultations in existential analysis are offered internationally by telephone. The first 50 minute consultation is offered free of charge to determine if the client and consultant are a good match and feel comfortable working together. Contact Defiant Power Solutions to schedule an appointment, inquire about pricing, or for more information. Consultations are only offered in English. 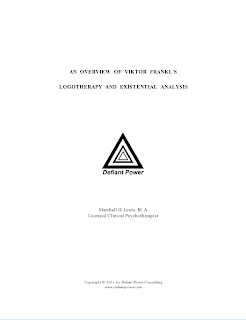 To celebrate, Defiant Power Solutions is giving away an ebook explaining Viktor Frankl's theory. The first chapter of the ebook is also the subject of this month's podcast: Overview of Logotherapy. by Marshall H. Lewis, M. A. This complementary ebook provides a detailed overview of the theory of logotherapy and existential analysis as seen by the author. It also discusses logotherapy's place within the fields of psychology and psychiatry. Click this link to download your free copy!